"I really enjoyed this fantasy adventure with animal shifters and a battle of good and evil. "Talon is on the cusp of manhood when he finally meets his "Rada-kin”, the animal companion which allows his telepathy and shifter skills to emerge. 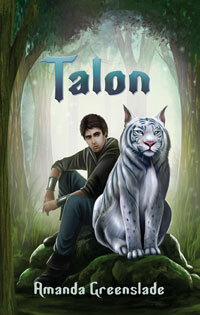 Talon’s special animal is a powerful icetiger which brings him quick respect from most of his clan. Talon’s people are Kriites who believe in a loving God (Krii) who takes the shape of a wolf and who helps the people through ‘magic’ of nature and spirit. Although the Kriites want to live in peace, they are being enslaved and killed by the cruel Zeikas who consider those who believe in any God but theirs (Zei) as inferior infidels. "The Zeikas have powerful magic which includes demon summoning but they do not have the strength of the telepathy that the Kriites have. A ruthless Zeika leader, Bar Harrar, believes he can take over Talon’s magical skills – or he will eliminate him if his plan to control him doesn’t work. "Talon’s town is attacked as the Zeikas seek to capture him. The town elders send Talon on a quest to discover the full extent of his powers hoping he can return as a strong leader to help them. They agree that a visiting ambassador, Sarlice, who has more experience, can serve as Talon’s guide to first travel together to seek the King’s assistance and protection against the Zeikas for their respective clans. The two young adults set off with their animal companions to make the dangerous journey with enemy Zeikas abounding and hope of allies unsure. "The characters are nicely developed with relatable emotions. I enjoyed the fun interaction between Talon and his icetiger as they get to know each other and their world perspectives. The world building is creative and workable and there is plenty of fighting action to keep things interesting. It was clear early in the story that this has allegorical elements of Christian faith, love and peace having to face a world full of wicked, evil, power seeking enemies. I like the good versus evil battle aspects as well as the telepathic and animal shifter magic so it is an engaging package for me. "It always amazes me how authors can create other worlds, complete with their own occupants, gods and animals, plants, landscapes that seem familiar and that are different and occupants who have abilities we can only guess at. Such a place is Chryne, created by Australian author, Amanda Greenslade. A place where magic abounds, where there exists the Kriites, a people who have animal bond-mates, the Rada-kin. Such a man Is Talon, who comes into his bond at later than normal and unexpectedly, with an icetiger. This happens just as his community is attacked by an opposing force, the Zeikas sorcerers and worshippers of the fire god Ziedarb. The Zieka want to bring the Kriites and their bond mates under their control. "Sent on a mission to ask neighbouring kingdoms for help, Talon and his companion Sarlice and their bond mates are tracked by Zeikas. They rescue a young woman, Lira, who joins them on their journey, only to betray them in startling ways. "As Talon and Sarlice race towards refuge they are pursued by a relentless group of Zeikas, who seem to want Talon for his bloodline and gifts. A tense story of action, of magic, and of the growing battle for the Kriites to remain free from the evil espoused by the Zeikas and to continue the ways of their peoples. "Where this series will lead is an intriguing puzzle. "—Heather B. "Talon is a young man, about 20. For his people, he is behind. He lacks his Rada-Kin. That changes, quite suddenly, and it is awesome! Talon finds his Rada-Kin, an [sic] blue icetiger. They are very rare, almost extinct. She is a magnificent creature, and being bonded to a Rada, changes everything for both of them. "I *LOVE* that right off the bat it's make clear that the humans were made in their creator's image and given dominion over the Earth and the creatures in it. Because of that Talon is even kinder and more connected to his icetiger. Both Talon and his new Rada-Kin serve The Lightmaker, Yes! This quickening of being Rada-Kin gifts the special animal the person is bonded to an extra level that other animals don't have. They become as sentient, self aware, as humans. Using the waves around them, they are able to communicate telepathically to the person they are bonded to, and they can sense each other's senses. That is fun, and while I have seen it in other books, I really liked it here. "This is the tip of the "iceberg". Talon may, or may not have a second gift, and he is also tasked with saving his people. Rekala, meaning Fury, the icetiger is kidnapped, and from here things just keep moving. "Talon is a young man just coming into his abilities. He happens upon an icetiger and confirms he is a Rada--one who shares a telepathic bond with an animal companion. And that means he also has a shapeshifting ability. But he also soon learns he may have more abilities than he imagined. When his homeland comes under attack by the Zeikas, a militant people who worship the fire-god, Zeidarb, Talon must rise against them. His abilities make him the best defense his people have. But the leader of the Zeikas is aware of Talon and his abilities, and he seems set on capturing Talon for his own devices. "It's a lot of pressure to put on a young man like Talon. And he's no family left to rely on. So he needs to figure out who he can trust and who he can't. And he soon learns there are plenty of people on both sides of that line. "I always enjoy writers who can create a world with a high level of complexity and present it in an easy-to-follow manner. And that's exactly what Amanda Greenslade has accomplished here. There are places and people and abilities and tribes and gods...so many names and words to keep track of. Yet I never felt like I had any real trouble doing so. And there's a good mix of action and history, allowing readers to understand the context without needing to read a whole chapter of the history of the world to understand it. “WOW. Amanda I am in awe of your writing. 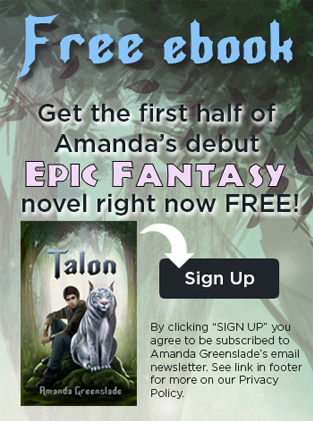 Thank you so much for giving me the opportunity to read Talon. At no time while reading did I feel bored, or uninterested. Your descriptions of the places, the people, even how they fought was so imaginative that it was easy to ‘see’ the story as it unfolded. I truly did not want the story to end. And I await with great anticipation your future published works. “You said you hoped to write a trilogy then perhaps build it to six. Please don’t stop there. I feel that both adults and children alike will be able to read your books and enjoy the world you’ve created. I believe that Talon is a greater story than Chronicles of Narnia, and on par with The Chronicles of Thomas Coveant the Unbeliever.”—Julie W.
“The first chapter was amazing. I love knowing the history and background of characters and books before I start reading them and to have that right up front in the beginning was great. Not to mention an amazing hook. I’m a wilderness and military type fan, so its great for me to see that right off the back your book starts off with a great hunter-gathering young lad. Plus you opened alot of door to rooms I’d like to explore right in the beginning. All put together its a great beginning, though I did get confused a few times by all the strange words and flashback type scenarios. But it’s ok the words add style and pizzaz to your story, making it original. I like the icetiger alot, with the amazing description you gave I believe it would make a wonderful drawing.”—Anthony L.
“Personally, I really loved the first chapter. I’m really excited for the book to come out now beause I can’t wait to see what happens next. I love that you did something I rarely see in books anymore—you created a main character that is not some young teen. He is older, more experienced, yet not yet a total ‘adult’. Most books try to ‘connect’ with younger readers by making a 14-year-old main character, but that can be a bit boring. I’m glad that you took it upon yourself to break that norm and create a very likeable main character.”—Shayna M.
“You really developed a large, imaginative world with many details. Very well thought out.”—Karen S.
“I think Talon’s wandering is a good vehicle for describing the world and some of your descriptions of the countryside are quite vivid, as are your descriptions of the skyearls and fighting scenes. I think these are the strongest points in the book. And you handle relationships reasonably well, and emotions, and almost all other aspects of writing.”—Stephen T.
“An excellent work! This is in the league of Lord of the Rings, Amanda. This story has all the hallmarks of an epic—a orphan’s quest, love, death and war, legends, lore, moral dilemmas, holy writings and panoramic vistas. With more of the ancient blood in him than most, Talon is destined to be an Anzaii, a master race of the original survivors, gifted—like apostles—by the Lightmaker. Talon’s quest takes him through worlds as sophisticated as any conjured by J.R. Tolkein, to fantastic tournaments, to forests of sapphire, sky kingdoms of chimera-like creatures, to a war of the spirits involving the most complex of weaponry and moral fortitude. The hero overcomes childhood frailties and self doubt, facing changes at every turn, ‘breathing them in like a fresh breeze,’ with the aid of his spirit-kin, an assortment of life-like creatures with endearing and charismatic gifts.”— Wendy M. Sargeant, writer and editor, Queensland Society of Editors. "At the beginning of the book the scene is set in a really nice way ... I enjoyed the fast pace of the novel ... I loved Talon as a character ... I loved the characters and the idea behind the Rada-kin. Being an animal lover I really loved the connection between the Rada and their animals. "Sarlice took a bit of time for me to warm up to and I really wish that we could have seen some parts of the story from her point of view. I would have loved to learn more about her weapon bond. In the end she turned out to be one of my favorite characters! Would you like to have your feedback added here? Please contact me.